I know, it’s easy to forget about this little, pink, fuzzy holiday after a stressful, packed December fundraising season. But you’re a fool (and not the kind that falls in love) if you think you should just skip it. Why? Because it’s one of the biggest gift-giving holidays of the year, right behind Christmas and Mother’s Day. Not to mention the fact that people can’t look anywhere without being reminded that the holiday is coming up. That’s not to say V-day works for all organizations — some of our clients have moved away from Valentine’s Day campaigns over the years if they have other compelling fundraising asks during that time — but plenty of people on your list will be looking for a unique gift for their honey or to send some cheer to someone who needs it. Here are 3 different tactics you can use to translate Valentine’s Day lovin’ into support for your cause. These are real examples we’ve taken from Sierra Club, Children’s National Medical Center (CNMC) and Wildlife Conservation Society (WCS), which runs the Bronx Zoo in New York City. When all is said and done, this wacky campaign not only raises valuable funds to support our slithery, furry, and feathered friends at the zoo and in the wild – but it also recruits thousands of new donors to the list. Extra tip: Cute, creative campaigns are gold mines for “special interest” news pieces. Pitch this to news outlets, advertise outside your list, and watch the traffic (and names, and donations) flood in! Sierra Club knows they’ve got it where it counts: cute animals. 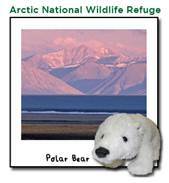 For Valentine’s Day, they take full advantage of the fuzziness factor and ask supporters to adopt a wild animal from one of the country’s wildest national parks and treasured places. When someone opts for this fine holiday gift, their chosen one gets a cuddly stuffed animal and Sierra Club’s campaigns to protect wild places and animals get critical support. Everyone is looking for interesting gifts, and really, what better way is there to tell your honey you can’t “bear” to live without them? Extra tip: It’s all about delivery by Valentine’s Day! Use the shipping deadline to really drive response. So you don’t have a virtual gift-giving program that you can color pink and red for Valentine’s Day – how else can you get people to get involved during this holiday? 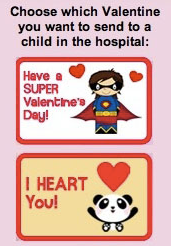 Take a tip from Children’s National Medical Center, who asks their supporters to send fun valentines directly to the children they serve. Would you believe that this is one of their biggest recruitment campaigns of the year? People just LOVE the innocent puns and cartoons that go with children’s valentines. It probably brings back memories from elementary school of a fun day of construction paper, glitter and heart-shaped lollipops. It’s not just the recruitment potential of this action that is valuable. It’s also a really tangible way for your existing supporters to connect with your mission. Later, they may be more willing to give! Extra tip: Design a few simple e-cards to let people choose which one they want to send. Supporters get to feel like theirs is unique without a huge investment on your part. Don’t let that end-of-year campaign hangover keep you from taking advantage of this great opportunity for your online program. Whether you raise money, generate recruits, or just give your list something fun or meaningful to do, make the most of this Valentine’s Day. Does your organization do something fun for your list for Valentine’s Day? Let us know in the comments how you make the most of the loveliest day of the year!